Note: If you do not maximize your browser window, the pictures below will look very small. Simple design is lazy design. It’s the easy way out; the surest path to mediocre blandness. Anyone can make a “simple” design that is serviceable. By its very definition, simple means easy and easy means anyone can do it. One of the unfortunate byproducts of the Bauhaus movement is the mistaken view that simple is elegant. Elegance comes not from simplicity but from beauty of execution and harmonization of forms. Can something simple be elegant? Probably, but today, not likely. You might be thinking now that simple designs are classics but you would be wrong. Classics are that because they are designs that stood the test of time and it might be old perhaps even dated, but it is still desirable. There are classics that are wonderfully complex and full of engravings as well as colorful pictograms. The classics that are just two hands on a white porcelain dial are only really desirable to serious collectors if there is a big name printed on the dial like PATEK and probably only because of it. 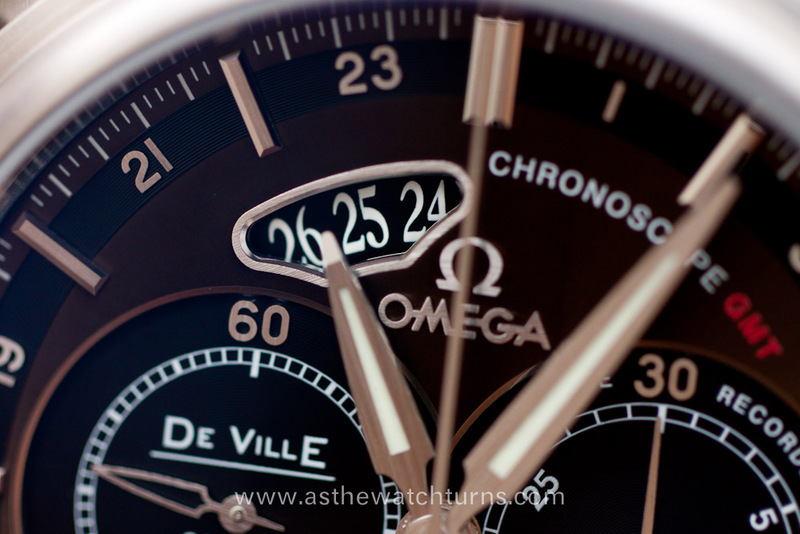 This is why I applaud the revolutionized Omega. They are trying to break out again with some adventurous design to appeal to a younger demographic that is more receptive to risk. This has always historically been Omega’s niche. 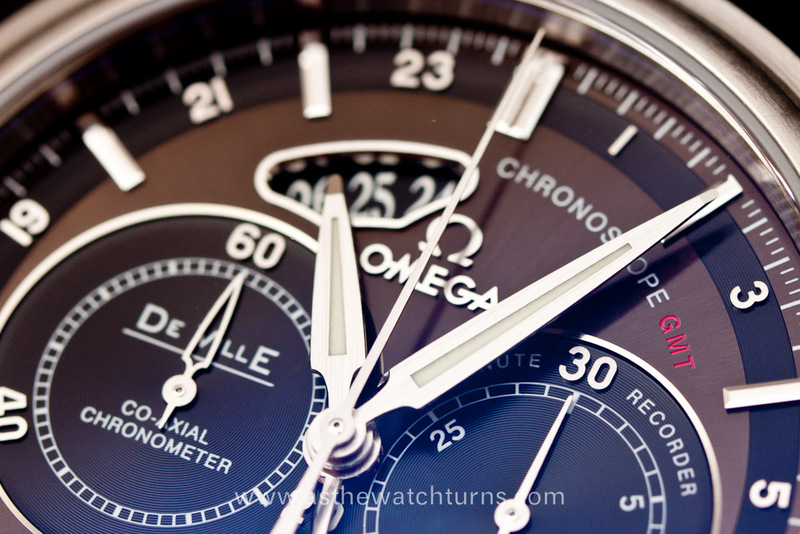 Even before they reopened as a brand, if you take a look at the Omega Ploprof you’ll see a clear example of this ethos. 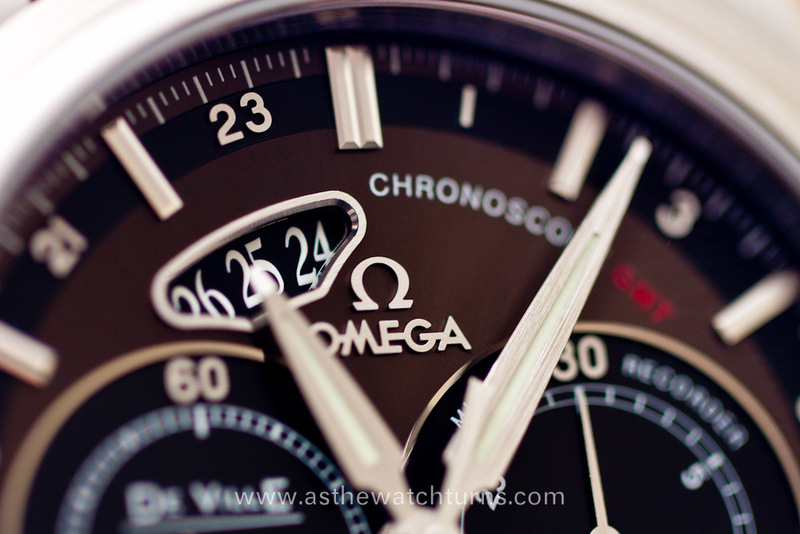 It seems in the fastest growing and one of the most profitable watch markets, China, Omega has a more favorable brand perception among the young affluent than Rolex. The casualty of trying to go out in so many directions at once is of course resale value as it becomes muddy which designs will become the classics that hold their value. 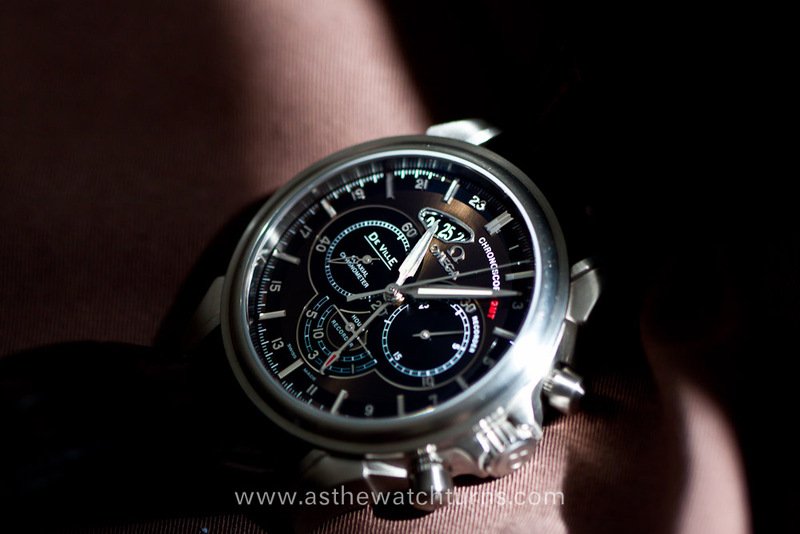 The watch being reviewed today certainly falls under that as there are several dial combination versions of the Omega Chronoscope. It is my belief (not just because I bought it) that the brown/brown version will become the most successful and lasting of this line. Other popular versions of this dial are red/brown, white/white, and white/brown but for various reasons, the colors just don’t harmonize as well. 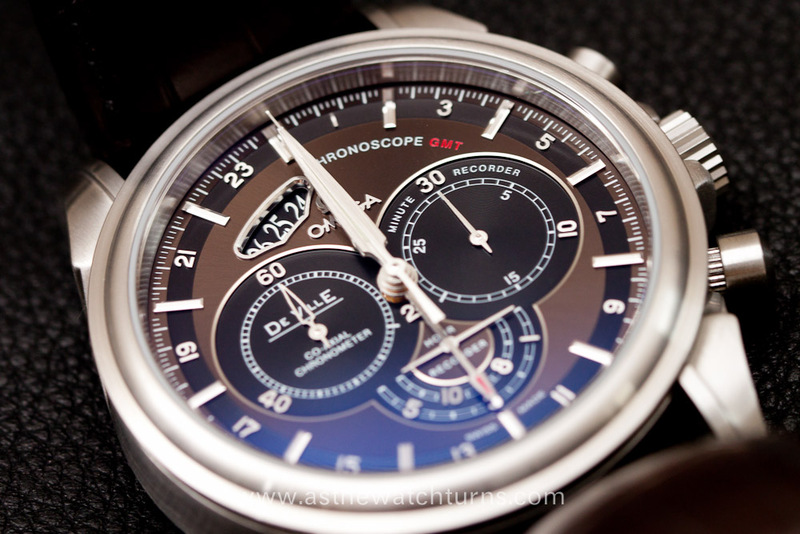 The shade of red chosen for the red/brown Chronoscope is unfortunate. With a darker shade of a more maroon color, it would have been more successful and evocative of fall colors. It seems in rattrapante form it’s also a bit of a Bond watch. 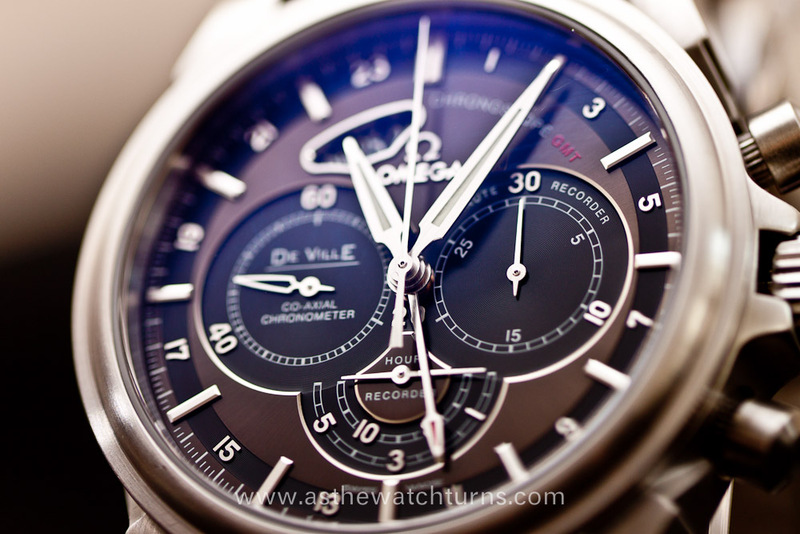 The DeVille Chronoscope is a balance between a steam punk style aesthetic mixed with a cleaned up modern touch. The typeface chosen for the arabic numeral markers is a contemporary no nonsense san serif which helps the busy dial be a bit more legible and constrains it from being overwhelming. This contrasts nicely with the expanded accented date window and it’s serif date font. You can see the care and meticulous design details expressed by even the bullion shape of the raised hour indexes, the carved out running seconds hands, and the shared 20 marker between the running seconds and chronograph. It’s a risky move to move away from a symmetrical dial. Symmetrical faces are almost always more attractive in both watches and people. Yet a well done element of asymmetry (see Cindy Crawford mole) is the dash of hot sauce that makes a bloody mary satisfying. 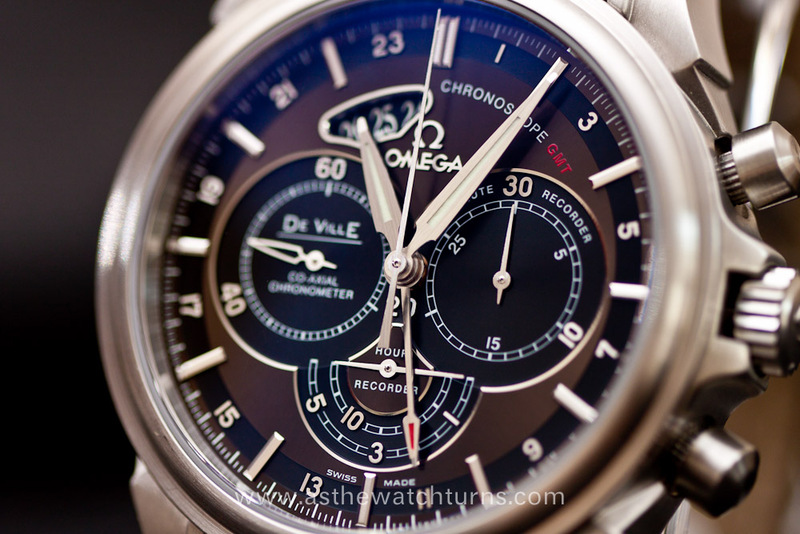 The expanded date window (center is the current date) and DeVille branding weighs the balance of the watch left yet it’s evened out by the red GMT markings and the visual heft of the chronograph pushers. Speaking of red, the red tipped GMT hand is nicely matched with the red GMT logo. 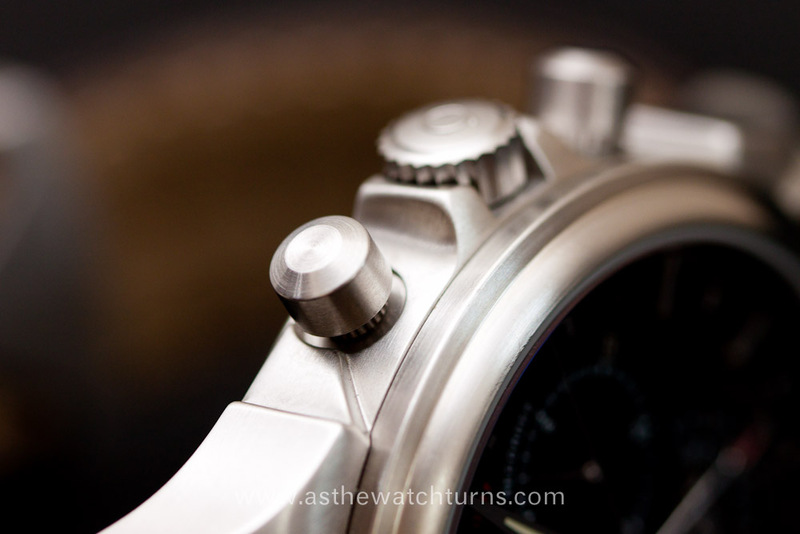 The theme of asymmetry is carried on by the hour subdial which is cut in half. After hour 6, the short side of the hour hand indicated the hour, quite ingenious. Overall, the dial is the watch in this case and it’s a carefully complex design with multiple layers that give it a unique 3 dimensional look. There are rings upon rings and polished accents but it never seems thrown together haphazardly. 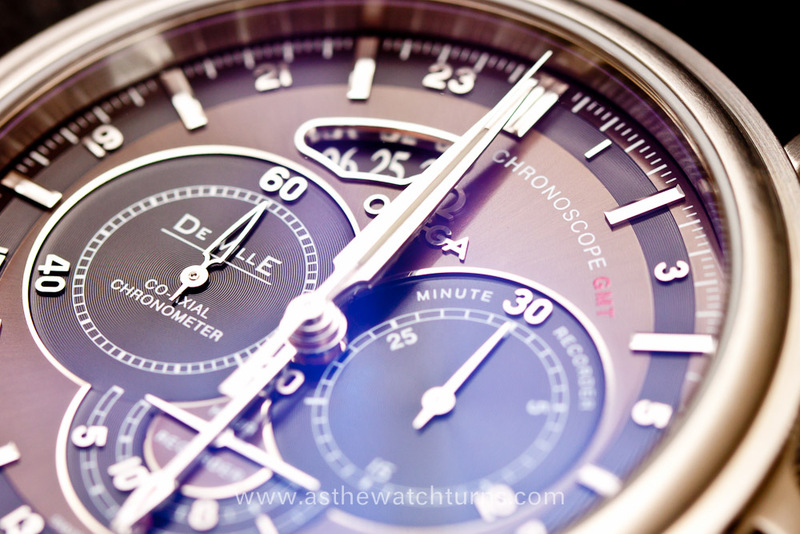 The surface of the dial has a very subtle brushed finish that you can see at certain angles. 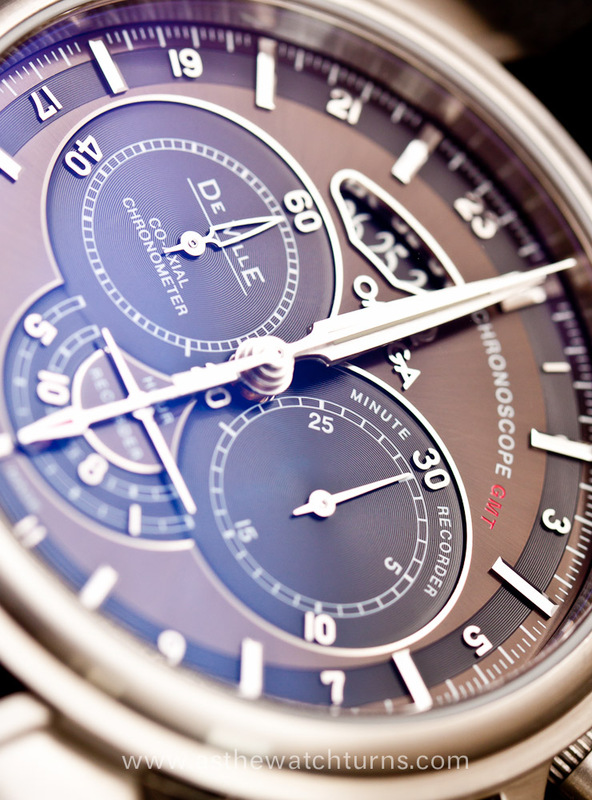 Most companies call this sort of finish “Anthracite”, this contrasts with the chronograph subdials which are made of fine concentric rings. 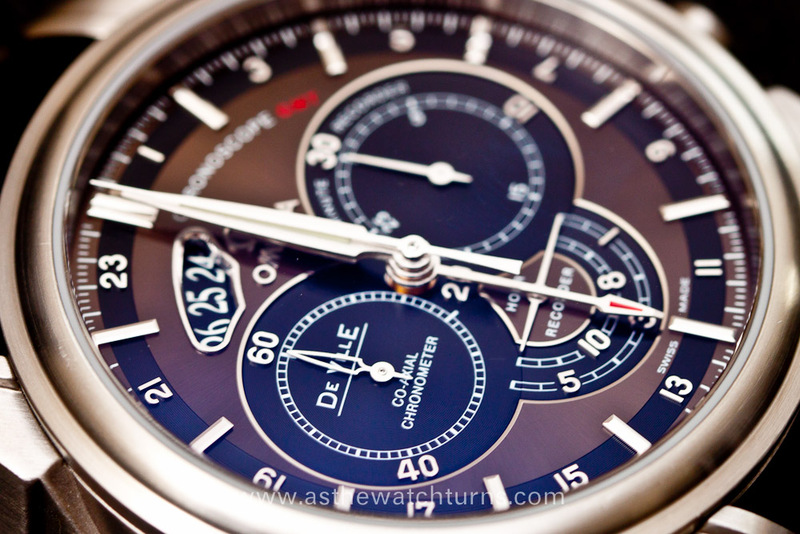 You will never get bored studying the intricacies and thoughtfulness of the aptly named Chronoscope dial. 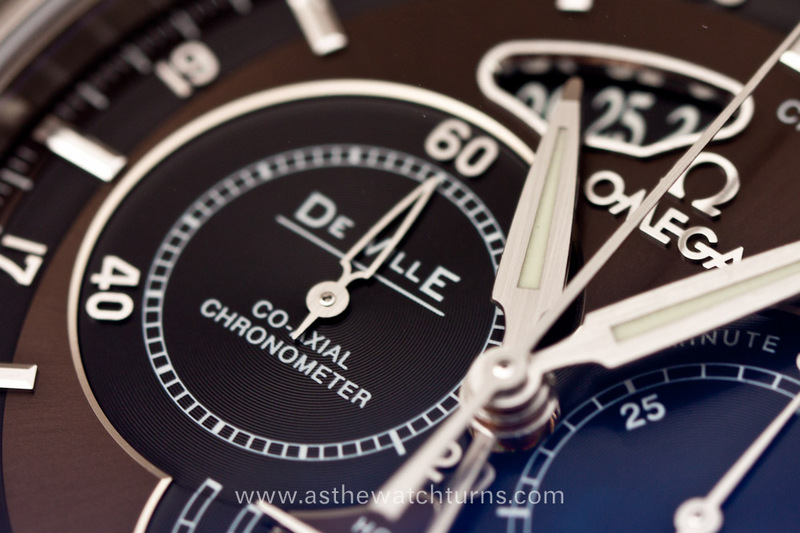 Co-Axial chronograph movements were controversial almost a decade ago when they were first released. 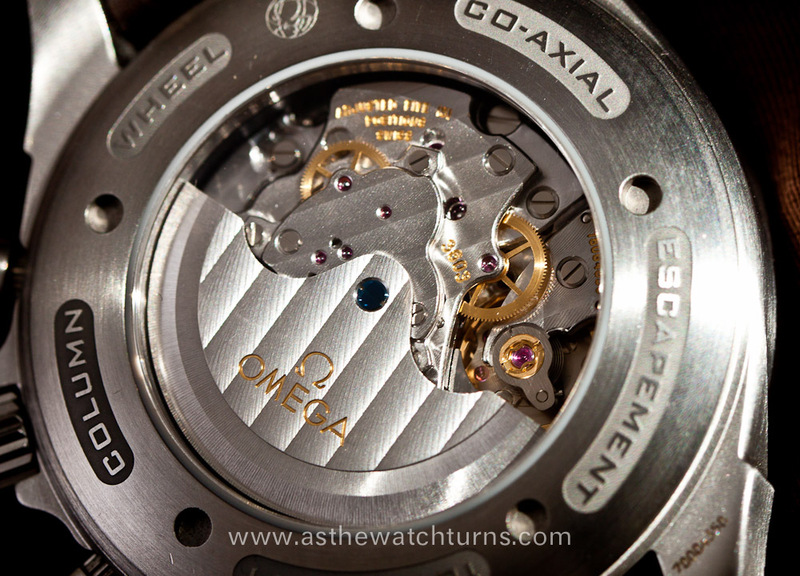 Omega forums and experts throughout were unhappy with what seemed like a reputation of fragility and unreliability with all of Omega’s first generation coaxial movements.. What it came down to was that the coaxial escapement was a revolutionary design change and as with any revolutionary change its never perfect on the first iterations. Since then, it seems Omega has worked out the kinks and its become much rarer to hear of problems with this movement if its not NOS (new old stock). The movement powering the Chronoscope GMT is the Omega 3603 which is based on the Omega 3313 which itself is based on the Piguet 1285. 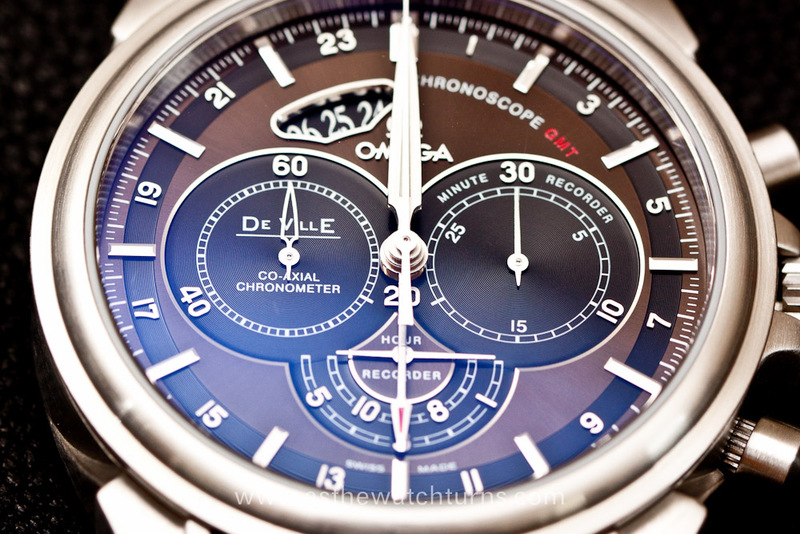 Piguet is in house to the Swatch group which Omega is also a member of. Piguet is a high end movement house that supplies Audemars Piguet, Vacheron Constantin, Blancpain among many other big names in luxury watches. The Omega 33xx series of movements have undergone some design revisions to make it more reliable and post 2006 versions of this movement should have all the hardware upgrades that Omega has decided to improve. The base movement itself is a high end design incorporating a vertical clutch (no wear to keep chronograph continuously running and a smooth non jumping start) and column wheel. 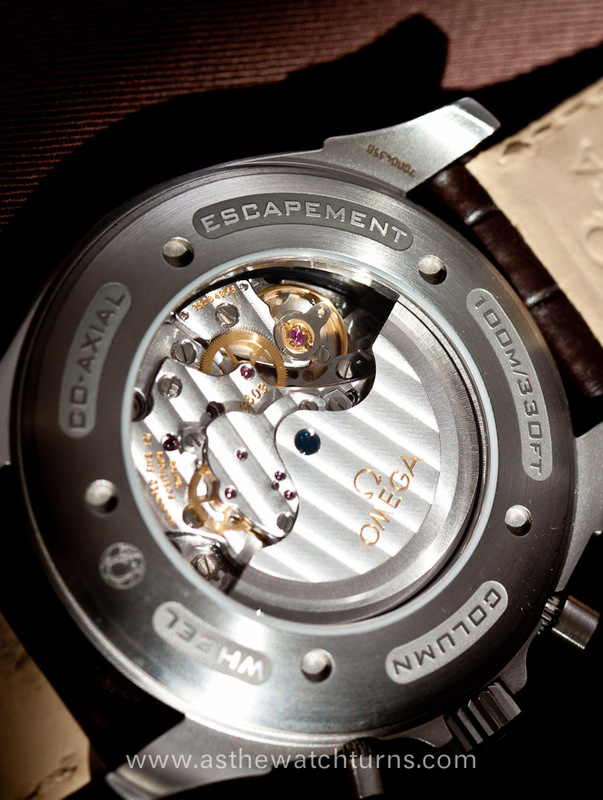 The movement is of course beautifully and impeccably decorated. One thing that does fall short with me though is that the rotor is attached just by a single blued screw. 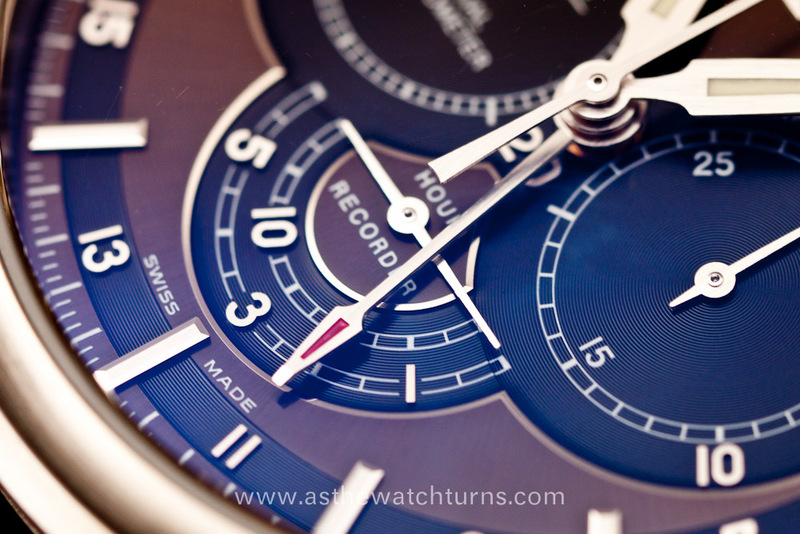 A triple system like you see on the Zenith El Primero or the Rolex 4130 would have been preferable and probably more shock resistant but this just seems to be how Piguet does it as you see on the Piguet 1185. In terms of features, it has everything you would expect from a movement of this pedigree such as a quick set date, bidirectional winding, and jump hour GMT hand setting. 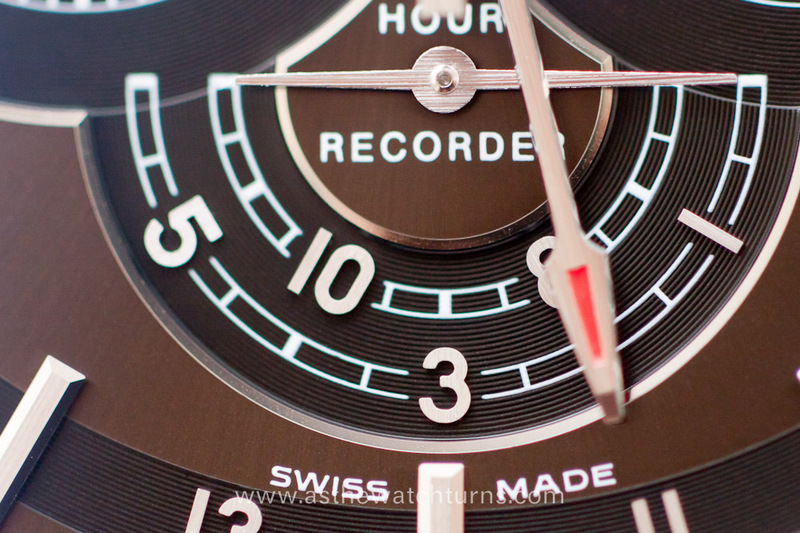 The main hour hand jumps in increments of 1 hour so that you can quickly set and reset the hour. The way to use it is that you keep local time of where you’re visiting on the main hands and the GMT hand keeps track of your home time. This of course doesn’t work for 30 minute different time zones but those are pretty rare. The winding is buttery smooth and the chronograph pushers are satisfying but not overly firm as such you might find in a lower grade ETA 7750. 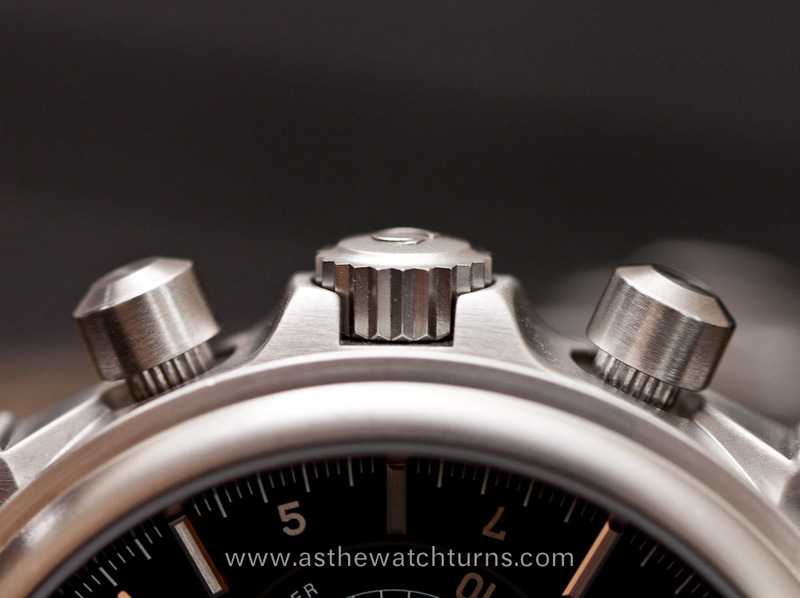 The vertical clutch and column wheel allow a non jumping seconds start which is a lot more appreciable than it sounds. If you don’t know what this is, please don’t look it up because it might drive you crazy and sour you to inexpensively made chronograph movements. The wrist presence of the watch is quite noticeable because of it’s large size (44mm) and the glossy face gives it a shiny sparkle that is eye catching. It’s one of the very few watches that I have owned which draws comments from strangers and friends. A sure way for me to get rid of a watch is if it’s too tall. No matter how much I like the design and pedigree (Bremont Supermarine 500, Panerai Subs), I have personally found that tall watches do not last long in my collection. This is something I appreciate about this watch, it’s large but not tall so doesn’t get in the way of my cuffs nor do I bang it on every corner of every wall. Omega has chosen a case that is completely brushed and it works well. The visual emphasis of this watch is completely on the dial while the brushed finish as well as the shape of the lugs adds to the steam punk aesthetic. The detailed pistons of the pushers matches nicely with the grippy crown. The pushers themselves are intricately detailed albeit if I had some criticism, I think a polished finish to the sides of the pushers would have given it a extra visual touch and diversified the fully brushed case. For those that might be worried, this is a non screw down crown design but is still rated for 100m. A bracelet is available for this watch. 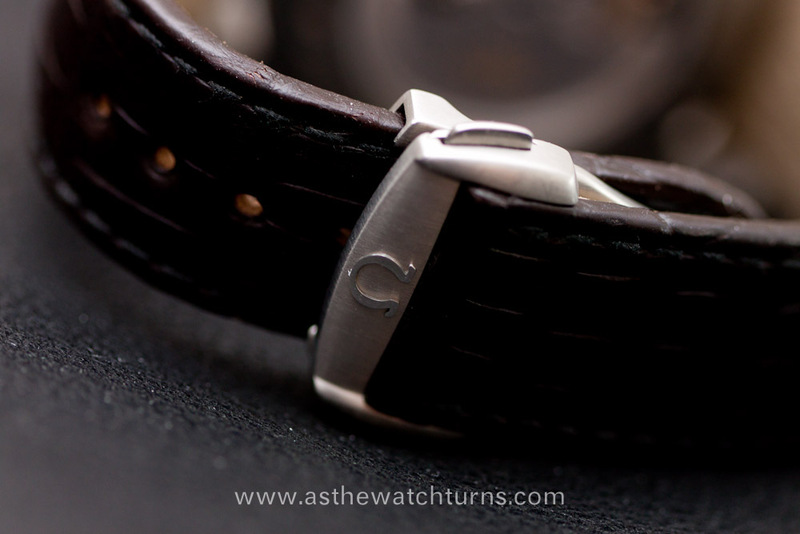 This version is on a dark brown strap that is 22mm by 20mm. 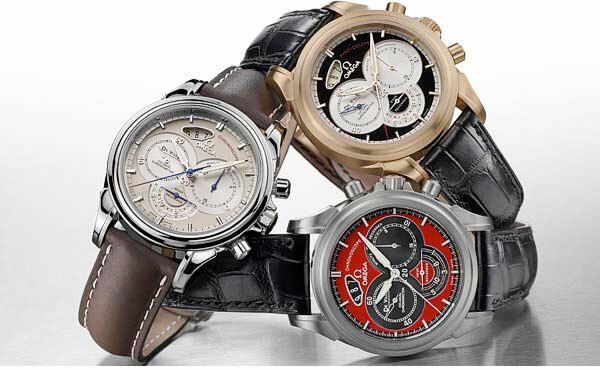 A rattrapante (double chronograph) versions are also available. The width of the case is 44mm without crown and the height is 13mm. What Omega has created here is a counterpoint to the staleness that too many brands are guilty of. In a world full of blah and landlord white walls, the Omega Chronoscope GMT is a measured splatter of excellence that fights the monotony of simple. 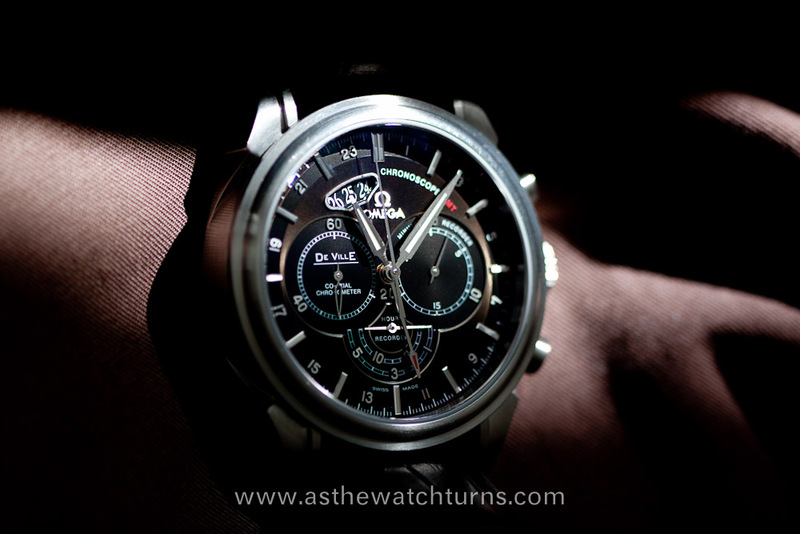 For everyday wear it has a lot of wrist presence but keeps things manageable by being not too tall and in the way. It’s not your run of the mill every day 7750 or variant thereof and shows it with a beautiful display back. It has earned it’s spot as part of my permanent rotation at least for the next few months.